There is nothing better than a cold drink on a hot day. That is, as long as that cold drink is able to stay cold as long as you need it to be. And until the advent of the koozie, this was a near impossible feat to achieve. A koozie is simply an insulated holder that keeps a can or bottle cold longer than if the can or bottle was kept naked. This is extremely convenient for parties, camping, tailgating; you name it, a koozie is bound to make a drink fresher longer. 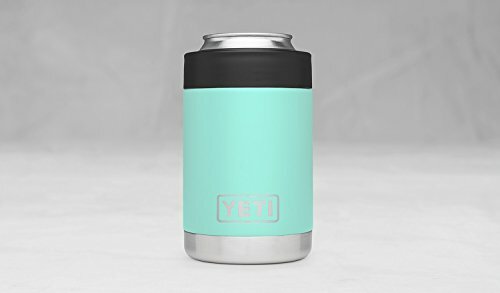 This stainless steel (both inside and outside) koozie is designed to keep 12-ounce cans cold, but can also be used with bigger cans if you desire. It has double wall insulation, which will keep your drink nice and cool, while at the same time keeping your hands nice and toasty. 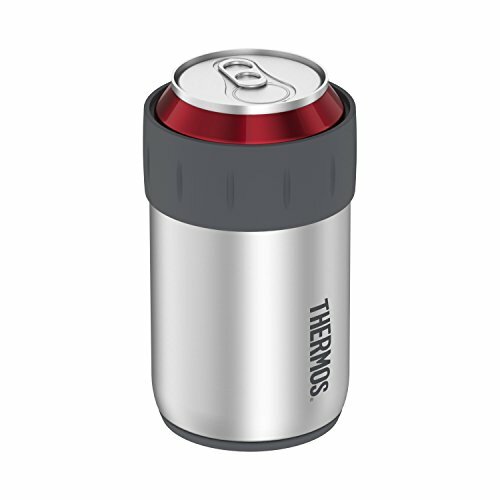 The Thermos koozie is constructed to last as it’s resistant to scratches and won’t slip off any surface. It’s also designed to make the user’s experience easier: with rubber grips on the outside for a better hold on the can. It’s also sweatproof, resisting condensation buildup. All this to keep you clean and comfortable. The Thermos is also designed to fit most automotive cupholders. Don’t forget, koozies are made to retain temperature, so this can certainly be used to keep liquids warm as well. No need to reheat your coffee when you get to work. 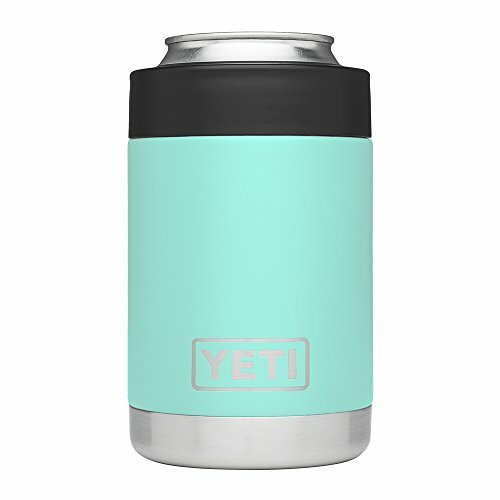 Very similar to the Thermos koozie, the Yeti Colster has double wall insulation, keeping yours drinks cold, but your hands warm, and is also sweatproof. Its design is finished off with DuraCoat color, ensuring that it will look newer and last much longer than other competetitors. Like the Thermos, it is also made of stainless steel and will be resistant to rust and damage. 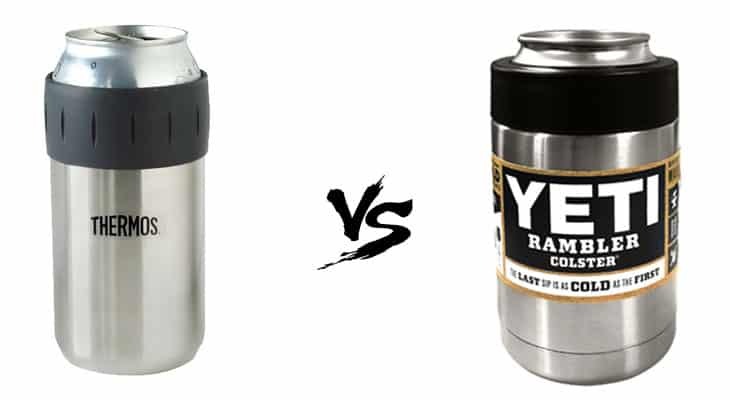 But there is an interesting feature that the Yeti has that the Thermos does not. The Yeti has a neat mechanism called a “lock and load gasket” that actually keeps your drink in place. 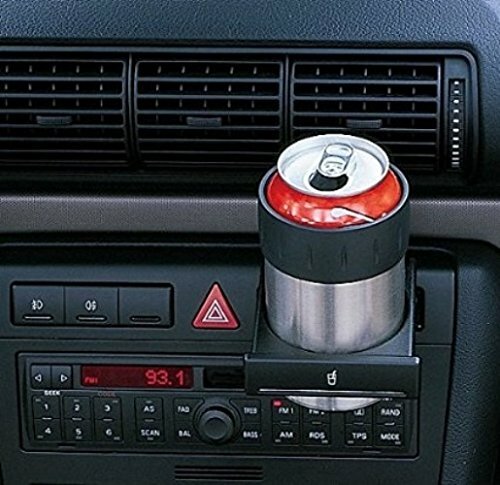 This also helps your drink to retain its cool temperature as it leaves no space between the koozie and the drink for warm air to sneak in. Additionally, you don’t have to worry about your can falling out. When comparing the two products side by side, there are some real differences between them. 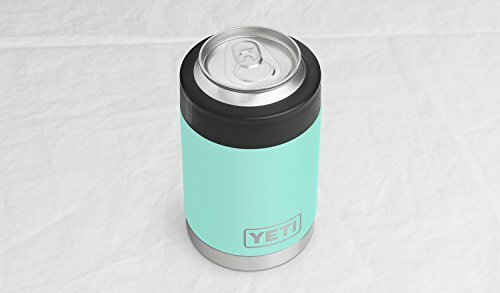 While Thermos is designed ergonomically and feels comfortable in your hand, the Yeti koozie is a bit bulkier and may feel more awkward. Not only that, but the Yeti is quite a bit heavier than the Thermos, which can make for a nuisance for holding it and also storing and transporting it. When you are packing for something like camping, the less weight the better. While the “lock and load” gasket is a very secure and unique feature to the Yeti, it may not be very conveneient. To use the Yeti, you will need to unscrew the gasket, place your can inside, and then reattach the gasket. This is not as quick and easy as the Thermos where you just put your can in and go. This feature might actually be more of a bother than it is a boon for the user. It seems like it could more of a waste of time to do all that just to put your drink inside the koozie. Where the two koozies significantly differ from one another is in the pricing. 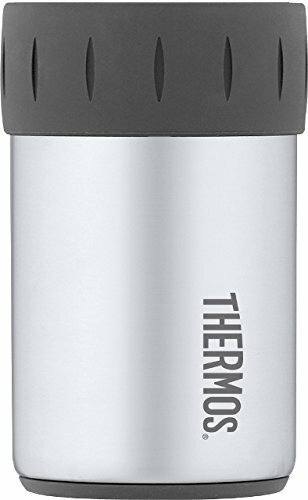 While Thermos is a good brand and known throughout the industry for making good quality products, the Yeti brand is well known throughout the industry for making great quality products. And you can definitely see this in the pricing of the two products. Expect the Yeti to be at least two times (sometimes even three times) the price of the Thermos. Koozies are a very important accessory to your drinks if you want to keep them cold outside of the fridge or a cooler. While the Yeti is a better-reviewed and preferred brand, its features aren’t enough to warrant its much higher price tag. The “lock and load” feature may keep your drink cooler longer, but how many people have the same drink for more than an hour or so? The bright choices in colors are a nice touch to the Yeti, but are they really enough to pay double the price for? The Thermos is definitely the best choice in koozies because of its ease in handling, convenient reloading, and most of all, its price. Why not save yourself money by going with the Thermos koozie? If you have enough left over, you can splurge on the Yeti cooler.